Enter the world of silent diving! 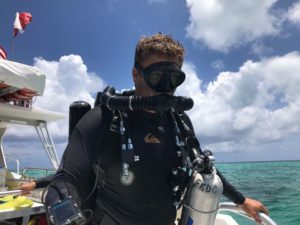 Whether you are interested in rebreather diving in general, or you are in the market to buy one and are researching different rebreather models, this one is for you! ScubaForce USA’s SF-2 ECCR Rebreather can now be test-dived at Florida Keys Dive Center. All it takes is making an appointment with us. No prior rebreather “knowledge” required, just bring your curiosity! We will start in the morning with an introduction of the SF-2 ECCR Rebreather. Our rebreather team leader, Instructor Trainer Carsten Huppertz, will present all unique features and design aspects, technical specs of the SF-2 and will answer all questions you may have. At around noon it is time to get ready to test dive the SF-2 ECCR with one of our rebreather instructors. You will do two dives at two different confined water locations on the coral reef. A total of 90 minutes dive time awaits you, ample time to get to know the SF-2 Rebreather in an ocean environment. 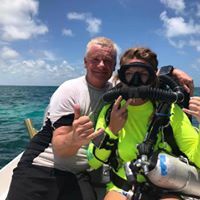 You must be 18 years or older, open water diver certified with a minimum of 20 logged dives and enriched air certified to dive on the SF-2 ECCR. Bring your proof of certifications! If you are not enriched air certified yet, no problem – we can fix that! Comparing Discover Rebreather Diving programs? Keep in mind, this one is a full day program that actually gives you a 90-minute dive experience in the ocean, not just only a pool session! The cost for this one day program is $299 plus tax per person. This includes the classroom presentation, two rebreather dives with an instructor, including charter fees, gas, scrubber.